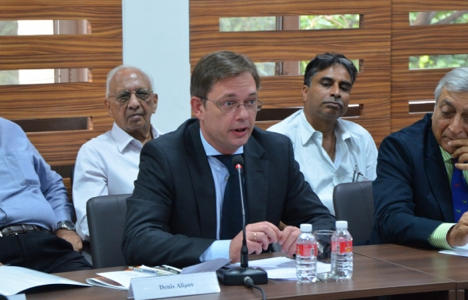 In a wide-ranging interview, Denis Alipov, Deputy Chief of Mission in the Russian Embassy in New Delhi, outlined his views on the Russian relationship with India and the situation in South Asia. The general sentiment, in India and more in Russia, is that the relations between the two countries have lost their earlier warmth. Do you agree with this, and if yes, why do you think this has happened? The Russian-Indian relations during the days of the Soviet Union were omnipresent indeed but it is essentially wrong to argue that the two nations have cooled off each other since. In fact, having disengaged from ideological background our relationship has become more sincere and warmer than before. These are the sentiments that overwhelmingly prevail in Russia and we are very proud of the unprecedented level of trust and friendship with India. This is true of relationship between the leaders of the two countries irrespective of who is in power in Moscow or New Delhi. This is equally true of feelings of the general public. Trust is the very essence of our relations, something that does not come overnight but is nurtured for years and tested at the times of hardship. If some started to believe otherwise I wish to testify as a longstanding insider officially and personally that they are fundamentally wrong. Russia and India pursue the same goals on international arena of which the recent BRICS and SCO summits in Ufa are indicative. Prime Minister Modi will visit Russia again by the end of the year for the bilateral summit expected to generate fresher ideas to deepen cooperation at both the global and bilateral levels. Russia is very extensively engaged with India in politics and economy although the latter has been less effective for objective reasons. I would say both the countries are rediscovering each other economically in terms of applying the capacity of private SMEs and start-ups while successfully maintaining traditional cooperation in such areas as hydroelectric power, mechanical engineering, metallurgy, oil and gas industry, petrochemicals etc. The most promising has been the area of nuclear energy. Russia is the only country practically collaborating with India in the nuclear energy sector. Two state-of-the-art nuclear power units with the world safest light water reactors have already been constructed at the Kudankulam site. Unit 1 is operational and unit 2 is being prepared for attaining criticality. Preparatory works for the construction of units 3 & 4 at the same site are underway. I would like to reiterate that the Russian engineers have successfully implemented all post-Fukusima safety requirements outlined by the Indian Regulator AERB. A very important factor is the economic viability of the Russian projects. The Kudankulam units offer the most competitive price for electricity strictly corresponding to the figures stipulated by the Indian Government. It is noteworthy that the Russian-Indian collaboration in the nuclear sphere is not limited to NPP construction. There are joint projects in nuclear science and on aspects of nuclear fuel cycle. Russian and Indian scientists effectively cooperate in research at the Russian Joint Institute of Nuclear Research in Dubna and within the framework of such international projects like ITER programme (International Thermonuclear Experimental Reactor). How many reactors will Russia eventually build in India? I would say as many as you wish us to. The Strategic Vision for strengthening cooperation in the peaceful use of nuclear energy signed during the bilateral summit in December 2014 provides for the construction of at least 12 units within the next two decades. This includes upto 6 more units at Kudankulam and units at other sites in India. We are expecting the Indian Government to soon announce and allocate a new site for these purposes. At Kudankulam Russian and Indian experts gained practical experience of construction and commissioning of the Russian-designed reactors. This platform will allow us to effectively continue with the construction of new units. How do you view the ties in the defence sector? In terms of volume and investments this is by far the most advanced area of bilateral cooperation. The value of our business in military hardware with India is over USD 30 billion, more than India has with all other foreign partners put together. And this business continues to flourish. Moreover, Russian-Indian military technical cooperation is based on transfer of technology and mutual development of hi-tech platforms, licensed production of modern Russian equipment in India and modernisation of Russian weapons, which are in service with the Indian Armed Forces. This kind of extremely versatile cooperation is hors concours too. By all means Russia and India has a unique partnership within the global military market serving as an enviable example of the combination of trust and benefit. Currently we are exploring new vistas of cooperation in research and development not only on GtoG but also on BtoB basis. Russian companies are in talks with Reliance Defence and Aerospace (RDA) for possible joint production of ships, submarines and aircraft under the transfer of technology. We have been deeply engaged with HAL for many years, which is India’s major public sector company and Russia’s time-tested and reliable partner. We are looking forward to expanding ties with Indian companies, which have been selected to participate in the “Make in India” programme. Russia is the only country, which has so far started working under this scheme. Again, while others talk, Russians do. Isn’t it the proof of the true strategic character of partnership? I think it is. What do you think is holding back the signing of the final contract for the Fifth Generation Fighter? Obviously such a sophisticated aircraft cannot be made overnight. It involves a long process of research and development, which is going on smoothly. This project is identified as a priority one by both countries, and we are committed to complete it as soon as possible. There is a lot of talk about Russia-Pakistan cooperation. There have been high-profile visits on both sides and agreements have been signed for defence and military cooperation. How do you view this growing relationship in view of your historical ties with India? Relations, which Russia develops with countries of the world, are not directed against anybody. Particularly, Russia’s policy in South Asia is consistently based on principles of promotion of regional stability and non-interference into the affairs of sovereign states and bilateral disputes. India is our historic and special and privileged strategic partner, and we have always been mindful and will continue to consider in the first place the Indian security concerns. This is our natural choice. The unique level of mutual trust and understanding on almost every issue of the international agenda should leave no scope for doubt about the future of the Russian-Indian ties even for sceptics. Hence the relations with Pakistan while being independent in nature will never have any designs against India. Islamabad is a very important player in joint efforts to maintain regional stability, especially in view of the deteriorating situation in Afghanistan and growing threats of international terrorism fuelled by ISIS and rampant drug production. These factors require collective counteraction and target-oriented capacity building. And these are exactly the reasons for our recent arrangements with Islamabad on the supply of four Mi-35 helicopters. I would also like to respond to the idle talk and pure invention of the media by reiterating that Russia has not discussed and does not have any plans to sell Su-35 aircraft to Pakistan. It was reported in the media that when Pakistan chief of army staff General Raheel Sharif visited Russia, a defence and military technical cooperation agreement was signed between the two countries. The agreement you mentioned pertains to the military cooperation and provides for a general framework for interaction between the armed and security forces and capacity building. The relations between India and Pakistan are not very good. Why don’t you informally facilitate talks between the two countries? Russia entirely supports the normalization of relations between India and Pakistan and the early and peaceful resolution of all contentious issues, including trans-border terrorism and Kashmir. However, we are not in a position to interfere in any bilateral dispute unless we get a specific consensus-based request or invitation. Certainly, we acknowledge the existing legal architecture, which includes the 1972 Shimla Agreement and the 1999 Lahore Declaration urging the two parties to resolve their issues bilaterally. Russia hopes that New Delhi and Islamabad will show further restraint and continue to improve their relations according to the Ufa spirit. Don’t you fear that unresolved bilateral problems between India and Pakistan may spill over in SCO when the two sides join it formally? Both India and Pakistan are welcome as full members of the SCO. The political decision to this effect was unanimously taken and the membership process was launched at the SCO Summit in Ufa in July 2015. The. This step will drastically increase the capacity and effectiveness of the organization in tackling of the growing regional challenges and threats. With India and Pakistan on board, prospects of deeper integration, transport and energy infrastructure and diversified economic and financial cooperation within the SCO will obviously expand. According to one of the basic principles of the SCO Charter the member-countries do not import bilateral issues into the SCO agenda. The same is expected of India and Pakistan. On the contrary, there is a feeling that the SCO may become an additional platform for narrowing down of the differences between the two countries through cooperation. What does Russia think of China’s One Road One Belt initiative? We support the Chinese initiative as a promising opportunity to promote trans-regional connectivity in Eurasia and improve linkages between Asia and Europe. A lot of attention is given to the development of transportation and energy potential of the Central Asian countries, from which the neighbouring regions will also benefit. There is a great scope for joint endeavours, and we would welcome the growing Indian participation. Meanwhile increased efforts are being made to expedite the North-South Transport Corridor project, which is designed to enhance connectivity and economic cooperation between South and Central Asia and Europe and harmoniously blends with the Chinese initiative. The interview was first given to Force magazine. Courtesy : Embassy of the Russian Federation, New Delhi.